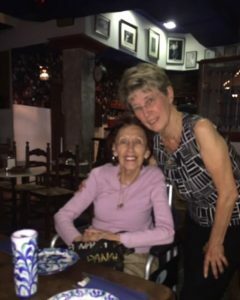 When my elderly mom (97-years-old) told my sister Kathy and me that she wanted to take a trip to Spain, we weren’t sure we were hearing right! Although reasonably healthy considering her age, our elderly mom can only walk short distances with her walker, uses a wheelchair and lives in her own home with a 24/7 care giver. It didn’t seem fair to tell her she couldn’t go because she was too old and fragile! So we began detailed and extensive planning for our journey to Spain. But first, we needed to obtain a commitment from Claudette, mom’s primary caregiver, that she would accompany us – and she gladly agreed. We decided that Madrid would be the ideal destination, as Delta had an evening non-stop flight from New York JFK Airport, a short car ride from mom’s home in northern New Jersey. With a nine-month lead time, we were able to get business class tickets at a reasonable price. Kathy, mom and Claudette flew from New York, and I flew from Phoenix. After a long search, we found a four bedroom, two bath apartment near Plaza Mayor (the main square). It had an elevator and accommodated a wheelchair. Fortunately, my sister is fluent in Spanish, so after speaking with the apartment manager about the location, apartment layout and suitability for mom, she booked the apartment. We purchased travel insurance with a pre-existing condition waiver. Now we were ready for the real work – the planning. Mom would take her walker and wheelchair on the flight. 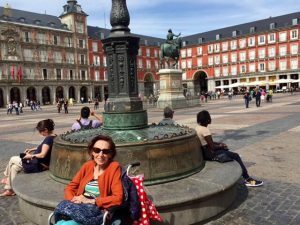 Kathy purchased a shower chair and toilet bars online for delivery to the Madrid apartment. The apartment manager agreed to accept delivery and have the items in the apartment when we arrived. Kathy ordered enough medication for the trip, along with back-up prescriptions. Mom drinks a juice-based Ensure that Kathy couldn’t have shipped, so she purchased it and packed it in the checked luggage. Next came the packing. With equipment to bring, along with clothing, medicines, Ensure, etc., this required careful planning. Fortunately, the apartment had a washing machine, so we could limit the amount of clothing we took. We had to bring the minimum number of suitcases possible, considering the logistics of handling the suitcases, carry-on luggage, walker and pushing the wheelchair. Departure day arrived. Kathy, Mom and Claudette set off for JFK Airport. The driver picked them up and they arrived in plenty of time to check-in and relax in the business class lounge before departure. They checked the luggage and headed for the security line. Mom rode in her wheelchair and carried her walker and hand luggage. When they arrived at the security checkpoint, the TSA singled mom out for a random inspection. As the TSA agent started to do a pat-down, she inadvertently knocked a pile of trays right onto mom’s head. Although not hurt, the resulting confusion upset Mom. My sister asked for an incident report in the event that mom developed any problems. Even after all of this – TSA completed mom’s random security inspection, so it took almost an hour to get through the security check point. Not a great way for anyone to begin a vacation. It is hard to believe that elderly people are treated this way. The flight went smoothly. Everyone enjoyed Delta’s business class lay-flat seats, after they finally figured out how to operate them, and found the food to be exceptionally good. When they arrived in Madrid, our Virtuoso on-site, “Made for Spain,” had a car and driver waiting to take them to the apartment and assist with their luggage. The apartment was wonderful, and perfect for our elderly mom. The modern apartment in an old city building had been complete renovated. Four good size bedrooms with comfortable beds, two modern bathrooms with walk-in showers, and a fully equipped kitchen with the promised washing machine. It had a dining room/living room combination with beautiful big windows with little balconies overlooking the street. We even had a flat screen TV and wireless internet. The grocery store was just a half block away. The biggest challenge came the next day – jet lag. It was difficult for everyone, however, at mom’s age, it was extremely so. It took several days for us to adjust, but Mom never really made the transition. She was disoriented at times, and didn’t understand the time change. She slept late, ate breakfast, then napped. So we worked around her and kept to a schedule that worked for her. Claudette cooked our afternoon meal and we ate around 3:30 or 4, after which we went sightseeing. 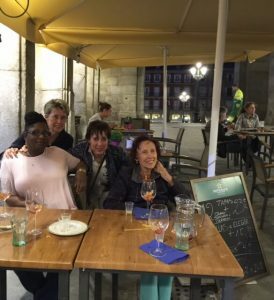 Then we had dinner at the “Spanish dinner time” – 8 or 9 pm (restaurants opened for dinner at 8pm). Kathy and I got up early – headed to a wonderful pastry shop a few doors down for coffee and croissants – then went sightseeing. We visited a few sights that Mom would have been unable to go to due to her mobility issues. We scouted out restaurants for the evening meal to be sure there was something mom would eat, vegetarian food for Claudette, and either a patio or a wheelchair friendly entrance. From our location near Plaza Mayor we were able to walk to many places – and although there were some hills, much of the area was flat. Taxi drivers were willing to help store the wheelchair in the trunk and give us time to help mom in and out of the vehicle. Kathy and Claudette even took mom on the hop-on, hop-off bus to see the sights. Buses lowered to the curb so the chair could wheel right on. Great restaurant near our apartment. We found a great restaurant halfway up the hill to Plaza Mayor. One day Claudette was pushing the chair up the hill and the waiter we had the night before at the restaurant came running over, took the wheelchair from Claudette, and pushed it the rest of the way up the hill! We had chocolate and churros at Chocolatería San Gines, Madrid’s most renowned chocolate café. San Gines dates back to 1894 and is open 24 hours, 7 days a week, 365 days a year! Mom loved the freshly made churros and dipping them in the cup of hot chocolate. We did lots of shopping, and at a flamenco show, the dancers delighted mom. All in all – we picked a great place to visit and a wonderful area in which to stay. Mom and me at the Flamenco show. I left to fly back to Phoenix, and Kathy, mom and Claudette were to fly back to New York the next the day. When mom got up that morning, she said she had chest pains. Kathy called the apartment manager who arranged for a local doctor to come to the apartment to see her. The doctor sent her to the emergency room for tests. After an examination, an EKG and medication to regulate her heartbeat, the doctors stabilized her. They discharged her several hours later, tired and upset. Made for Spain, our favorite tour operator in Spain, saved the day. They arranged hotel rooms until they could get a flight back, sent a car and driver to pick them up at the hospital, stopped and got their luggage from the apartment manager and took them to the hotel. Delta was great and changed their tickets to business class seats the next day. We are so glad we made this trip. Even with all the difficulties we encountered, Mom loved it – and now has the best bragging rights ever. Sure she was uncomfortable at times – but she is uncomfortable every day at home. It comes with the territory. And we got to spend a great family vacation in Spain! This great family vacation was in May, 2016. Mom passed away in September. The memories will last a lifetime for my sister and me.